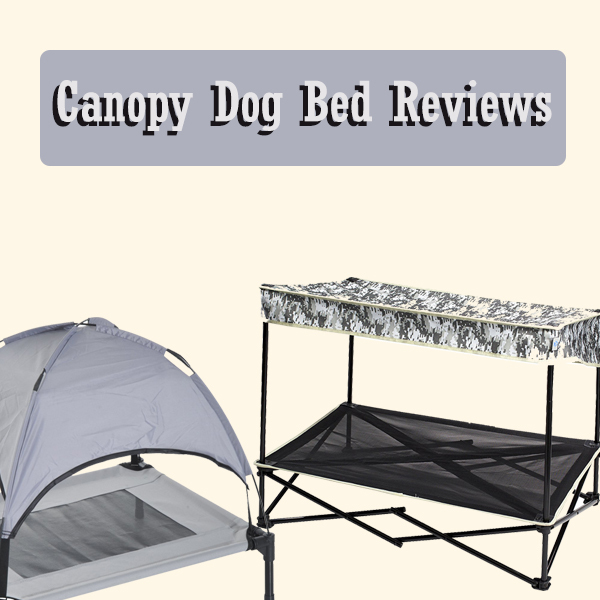 A canopy dog bed is one of the most appealing beds that you can order for your dog. It is particularly designed with small and medium-size dogs in mind with the use of extremely comfortable memory foam. Such a bed is made with a special design. It starts with a flat surface that you will place a bed on—and is, of course, a waterproof dog bed. It can be square, rectangular, circular, or oval in its shape. Either way, it must have enough room for a soft mattress that is easy for your dog to sleep on. After you add the bed, you will have a canopy top to work with. This will include supports on all the corners of the bed. This can be used to create a nice decorative metallic accent or it can prepare a shield or cover over the mattress. You could even find some options that provide you with a curtain-like design. One thing is for certain in that a canopy dog bed will give your dog a special place to sleep while being treated like the king or queen of the house that your dog is. 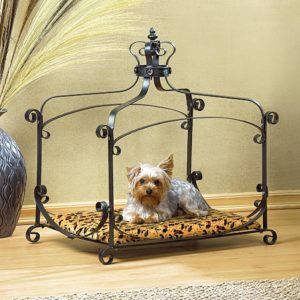 Here are a few of the top canopy dog beds which you can have in your home today. A quick note: Depending on the model, you might have to get a soft mattress or other surfaces separately from the rest of the bed. The first option to see is from Pawhut. It is elevated by about seven inches off of the ground and is flexible enough to handle your dog’s weight while still being large enough to where you can easily add a mattress or other soft surface onto it. The base has a mesh fabric that is comfortable even if you don’t add anything. The base has a mesh fabric that is comfortable even if you don’t add anything onto it. This allows air to move through the bed to keep your dog from being too hot. The canopy top features an opaque design that keeps the sun’s rays from moving through. 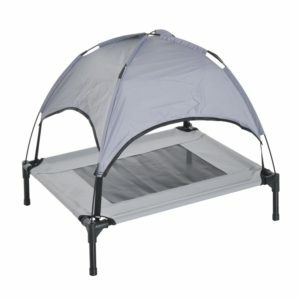 It also has a few straps to help you secure the bed in its place if you plan on using it outdoors. This is available in 30, 36 and 48-inch sizes. 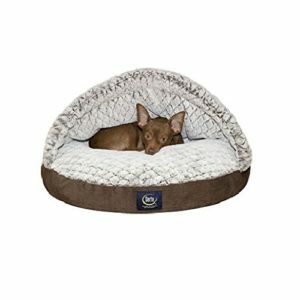 This next pet bed features a soft body with a nice canopy that covers up about half of the sleeping surface.This offers a nice shade when positioned right. This is a rigid option that does not move up or down but it does offer enough protection for your dog. Serta, one of the top companies in the world of mattresses, made this with a two-tone plush fabric while a fiber fill creates a comfortable body to sleep on. This even comes with a machine-washable cover so it will be easy for you to care for this. The main body of the bed is also sturdy enough to keep from being torn up by your dog’s claws. The key part of this canopy bed is that it has a great steel frame while the mesh surface on the bottom can handle a great deal of weight without being rough or hard. It can also support a great plush bed that is up to 36 inches long and 24 inches wide. The bed also supports up to 60 pounds of weight, thus making it suitable for small and medium dog breeds. The polyester canopy is angled to keep rain from pooling up on its body. Meanwhile, its design is made to be easy to apply without falling apart or letting in the sun’s rays. 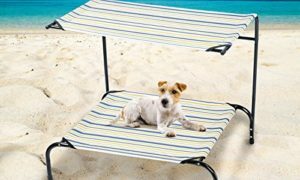 This can help you quite well with keeping your dog from being too hot from the sun’s rays. The bed is easy to assemble and has plastic feet that are sturdy and have stoppers on the bottom to keep the bed from shifting around. It can handle the pressure that comes from a dog jumping onto the bed and will not shift all that much when in use. It is also available in four colors to create a nice look anywhere. This Furniture Creational bed may be your best option if you’re looking for something a little more high-end in nature. This comes with a metal body that features a grayish tone all around. The top part offers a crown-like look with a few fake jewel accents. It adds a beautiful luxurious look to the bed. This comes with an animal print velvet sleeping surface but you can add any kind of soft mattress that you want to the bottom of the bed. The surface is rectangular in shape but the openings all around are designed to where it should not be tough for many dog breeds to fit on it. Also, you can add a curtain-like cloth onto the top parts of the canopy if you wish but you will have to watch for how you affix it. This should be applied to where the cloth will stay on the frame and not be easy to pull off. 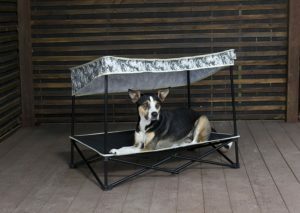 A key part of this canopy dog bed is that it has a canopy that can be removed. It is applied on one horizontal end of the bed and creates a comfortable shade. The polyester design lasts for a while and is opaque enough to block out the sun’s rays. It offers a comfortable shade over the sleeping surface provided it is arranged well in your room. This is easy to wipe off when it gets dirty. The polyester bed surface is also soft and flexible as it takes in about 20 to 30 pounds at a time, making it useful for many smaller and some medium-size dog breeds. You can always add a softer flat surface onto this part of the bed if you prefer. Your dog deserves only the best possible space for sleeping. 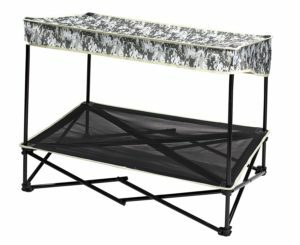 Check out all of these canopy beds when looking for a special spot for your dog to sleep on whether it is indoors or outdoors.